Bulgaria’s Prime Minister, Boyko Borisov, stated the Council of Ministers is giving consideration to structural changes in the cabinet. 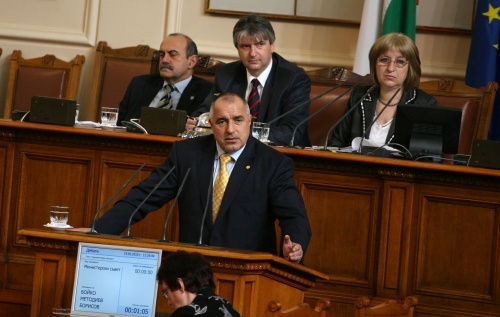 Borisov spoke Friday during the regular parliamentary control session. “We wish to improve the situation, including by making staff changes,” Borisov informed, adding he is still waiting to hear the opinion of European experts over fears that the appointment of a Deputy PM in charge of the EU funds can delay EU programs. “We have invited European Commission experts next week. We are asking them so that we avoid making a mistake,” Borisov said. For weeks now the Democrats for Strong Bulgaria (DSB) party, which is part of the rightist Blue Coalition, insists before the PM and the Finance Minister, Simeon Djankov on the appointment of an additional Deputy PM and on changing the structure of managing the absorption of EU money. At the end of February, Borisov stated there was no need to appoint a new Deputy PM for the time being. INSEAD Professor Ilian Mihov had been tipped for this position but he temporarily withdrew his bid in February. Meanwhile Darik radio reports that the PM made an unofficial statement in the Parliament’s hallway that the Mayor of the central city of Gabrovo, Tomislav Donchev, had been slated to take the post of the EU Funds Minister.